The return of Irish international duo Jacob Stockdale and Will Addison to the Ulster starting line-up sees a reshuffle to the backline for their European Champions Cup tie in Llanelli. Stockdale, who scored the crucial try which saw Ireland defeat New Zealand for the first time on home soil last month, is named on one of the wings for the crunch Pool Four game at Parc y Scarlets. Will Addison has recovered from an HIA sustained in the final Irish Test match against USA. Louis Ludik moves to fullback to accommodate Stockdale’s return to the wing while Addison moves into the inside centre position and Stuart McCloskey moves to the outside midfield role. There is a further boost with the return of two more internationals to the starting XV. 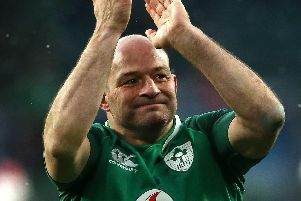 Captain Rory Best, who came off the bench against the Blues last weekend and immediately lifted the Ulster mood is joined in the pack by Iain Henderson. Best will also equal Andrew Trimble’s club record of 71 European Cup appearances. Samson Lee also comes back after missing the autumn Test series with the Welsh with a hamstring problem but Leigh Halfpenny and Jake Ball are out with concussion. Davies is one of six changes made by head coach Wayne Pivac from the side that lost to Glasgow in the PRO14 last week. Captain Ken Owens and scrum-half Gareth Davies return after being rested last weekend but centre Hadleigh Parkes is only named as a replacement with Kieron Fonotia keeping his place alongside Jonathan Davies in the midfield. Replacements: Ryan Elias, Wyn Jones, Werner Kruger, Steve Cummins, Dan Davis, Kieran Hardy, Dan Jones, Hadleigh Parkes.